The tall bearded iris is among the most rewarding drought-tolerant plants, and right now is the ideal time to plan for irises in your garden. There are several iris genera and species, and several varieties of the bearded iris. The tall bearded iris is the most popular variety, the result of the past fifty or so years of hybridizing. The hybridizers’ patience and creativity have yielded an amazing range of colors, color combinations, patterns and blossom forms, as well as plants with great vigor, productivity and in some cases repeat blooming. The early fall is the time to plant irises, but they are blooming now, in the early spring, making this the time to learn about the varieties and choose plants to add to your garden. The occasion for this timely and enjoyable pursuit is the Monterey Bay Iris Society’s annual show, scheduled for this weekend. This event features the best plants grown by local gardeners. There are a few “ringers” among those displaying their plants (people who grow irises commercially), but they are also locals and active participants in the Society’s ongoing educational programs. A room full of top quality irises can be overwhelming to those not already familiar with these striking plants, and perhaps intimidating. You might even think, “How could I grow such impressive plants?” A good defense to such feelings is to read “How to Grow Tall Bearded Iris,” which is freely available online from the MBIS. This two-page tutorial will make clear that irises are among the easiest great garden plants to cultivate and provide the confidence to bring them to your garden. Another very good preparation for this show is to look through the Show Program, which is also available online from the MBIS. 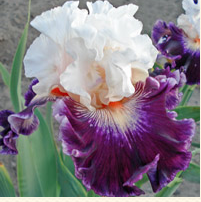 This eight-page document is packed with information about the categories of irises in the show, the exhibition rules, and the awards to be won. The Show Program provides an excellent orientation to the blossoms to be seen at the show. The Program also includes information about membership in the MBIS and a calendar of the Society’s sales in June and July, anticipating planting in August and September. This show is conducted according to the rules of the American Iris Society, and a team of expert judges will evaluate the blossoms. This process occurs on Saturday morning, before the show is open to the public, so visitors will see which blossoms have received first, second or third place awards. Visitors to the show are invited to vote for the People’s Choice Award. Irises can beautify your garden! Some might regard November as the beginning of the dormant season, with little or nothing for gardeners to do until spring. Not true! Beginning now, we can pursue selected gardening projects will pay off later in the year. Still, the garden does not demand intensive work and daily dedication by the gardener during this season. It’s quite all right to take time off to celebrate the holidays, avoid nasty weather, and otherwise enjoy life’s many pleasures out of the garden. There are many good gardening projects to do now in the garden; let’s consider three projects that are worth attention during November. Visit your local nursery for cool-season flowers, e.g., pansies, calendula, candytuft, foxgloves, snapdragons, stock, sweet peas, and sweet alyssum. Plant seedlings of cool season vegetable such as broccoli, carrots, cauliflower, chard, lettuces and greens, cabbage, potatoes, radishes, peas, bunching onions, and spinach. Look for six-packs of seedlings at garden centers or farmer’s markets. Several beardless iris species are native to the Pacific coast. Because they cross with each other freely, they are often referred to either as PCIs or Pacific Coast Hybrids (PCHs). Most common locally is the Douglas Iris (I. Douglasiana), named for David Douglas (1799-1834), who was the first botanist to describe this plant as it grew in the Monterey Bay area. PCIs can be grown from seed, but more often from divisions. After listing a mature PCI clump, pull the stalks apart and store them in water for a few days as they develop white roots at least a half-inch long. Then, plant the divisions and keep them moist until four new leaves appear. Seasonal rains could be sufficient to establish the divisions. Plants vary in their ability to tolerate relocation. Roses and hydrangeas, for example, adapt quickly and easily to being moved, although they appreciate careful handling: lifted without being damaged, moved to a hospitable location (full sun for roses; morning sun and afternoon shade for hydrangeas), and watered in. Generally, it is easy to move plants that tolerate rejuvenation pruning, e.g., abelia, dogwood, honeysuckle, hydrangea, lilac, mallow, penstemon, rose, Rose-of-Sharon, salvia, spirea and many others. Shrubs with fine root systems, e.g., azaleas and rhododendrons, do not respond well to being moved. For information on specific plants, search the Internet using the plant’s common or botanical name. Visit ongardening.com for successful search methods. At this time of the year, plants are dormant, but not gardeners! The Yerba Buena Nursery website has a helpful pruning calendar for California native plants. The National Gardening Association has brief but solid advice on dividing perennials. Master Gardener Marie Iannotti, writing on Ask.com, offers a good overview of pruning for several categories of garden plants. We are in iris planting season, made apparent by the annual sales of the Monterey Bay Iris Society and the deluge of catalogs from iris growers. Iris family (Iridaceae) is huge, with about 2,000 species distributed among 65 genera. The bearded irises, the most popular form, are hybrids based on the German Iris (I. germanica), the Sweet Iris (I. pallida) and the Hungarian Iris (I. variegata). Bearded irises are available in many sizes, colors, color combination and blossom types, thanks to the tireless work of professional and amateur hybridizers. Today, we review the six horticultural classifications of the bearded iris, both to broaden appreciation of this popular garden plant and to suggest landscaping opportunities. Miniature Dwarf Bearded Iris (MDB): These are smallest (up to eight inches tall), and earliest to bloom, with the crocus and dwarf daffodil. Each plant produces multiple stems, providing a great display that lasts for weeks. Tall Bearded (TB): These, the largest and most popular of the bearded irises, grow to 27.5 tall and more. They are the last to bloom. Medians: there are four “medians,” all created by crossing MDBs and TBs. Standard Dwarf Bearded Iris (SDB): Eight to sixteen inches tall. Blooms after the MDBs. As edging plants, they make a charming display. Their popularity with gardeners and hybridizers is growing, and new hybrids are appearing in great numbers. Intermediate Bearded Iris (IDB): Sixteen to 27.5 inches tall. Blooms over a long period, beginning after the SDBs and continuing during the TBs. These provide welcome smaller versions of the TBs for a different look in the garden. Miniature Tall Bearded (MTB): Also sixteen to 27.5 inches tall; blooms with the BBs and TBs, but produces smaller blooms. The MTB’s smaller flowers are perfect for smaller gardens and a more delicate look. Border Bearded (BB): Also sixteen to 27.5 inches tall; blooms late, with the TBs. This classification’s name suggests its role: these irises are desirable for the garden bed border, compact and floriferous, with ample colors and color combinations to support creative color effects in the landscape. Last week, I mentioned the Annual Rhizome Sale of the Monterey Bay Iris Society, Saturday, August 10th (that’s today, from 9:00 to noon!). Visit the sale at Aptos Farmer’s Market, Cabrillo College, Aptos. It’s an exceptional opportunity to add tall bearded irises to your garden at very low cost, and chat with local iris enthusiasts. I mentioned recently that the imminent annual rhizome sales by the Monterey Bay Iris Society. If you made notes, you know that the first of two sales happens today, at the Deer Park Center in Aptos. If you didn’t write a reminder to yourself, by the time you read this, you missed it. Happily, the second sale is a week away, at August 11th at the Aptos Farmer’s Market, located at Cabrillo College. For details, visit http://www.montereybayiris.org. These sales are very popular: the rhizomes are favorably priced and sell quickly. Their popularity begins with the plants themselves, which most gardeners find both easy to grow and stunningly beautiful. The extraordinary range of colors—and color combinations—that iris blossoms display have earned the plant’s name, which comes from the Greek word for the rainbow. Iris hybridizers search diligently for new colors, color combinations, patterns and textures, at the same time striving to improve the species in terms of blossom size, number of blossoms, overall form, vigor, resistance to disease and other traits. The hybridizing process, like that of all flowering plants, seeks to combine the desirable characteristics of two plants. For example, one might have blossoms with very beautiful colors while the other has attractively ruffled blossoms. The hybridizer transfers pollen from the anther of one plant (the pollen parent) to the stigmatic lip of the other plant (the seed parent), plants the resulting seeds and evaluates the progeny. It is up to the plants to produce new plants with a marketable combination of features. The result of this continuing quest for improvement is an ever-expanding multitude of named varieties and the evolving opportunity for the iris fancier to add to his or her collection. Each year brings new introductions with unique names. All the new hybrid plants do not combine the desired characteristics as the hybridizer intended. Each trial inevitably yields many new plants that do not improve upon their parents. The hybridizer does not offer such seedling as new named introductions, so we who buy irises for our gardens see only very attractive plants. The “duds” are discarded. Most hybrid irises are descended from one of just three species in the genus Iris: the German Iris (I. germanica), the Sweet Iris (I. pallida) or the Hungarian Iris (I. variegata), all of which are categorized as “tall bearded” irises. The hybrids of these species number in the thousands—and counting—but the genus includes about 300 species. Gardeners who appreciate the unique form and stunning range of colors of the iris have ample opportunities to look beyond the popular hybrids and explore the long list of naturally occurring species. The websites of the American Iris Society and the Monterey Bay Iris Society provide detailed information on the cultivation of irises. Note: Most growers carry at least a few species irises in addition to the ever-popular hybrid tall bearded irises (called TBDs). The growers listed below place greater emphasis on the many alternatives to the tall bearded irises.